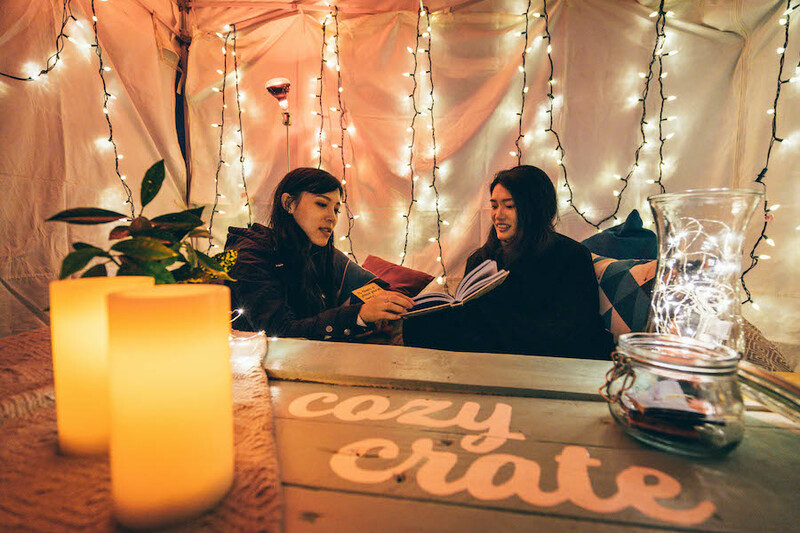 Cozy Crates was born out of the need for free third spaces that emphasize the importance of intentional leisure time and new human connections. In a city already known for its gloomy skies and aloof citizens, we envisioned a warm and welcoming space that invited people to connect with each other, removing the barriers of weather and the pay wall. Vancouver’s lack of rain-proof infrastructure for gathering during the fall and winter months veered our idea from creating a cozy space, into the realm of rain infrastructure. Our idea formed around the basis that communities are most likely to enjoy and respect a public space if they play a part in creating that space. We decided to provide a placemaking toolkit specifically for the winter and fall season, that would streamline the placemaking process and include instructions on how to set up and use a cozy space. The intention behind designing a kit is to empower the community to create their own cozy spaces, by making it as easy and straightforward as possible. During our prototype we learned that a huge number of people would like to see more of cozy crates around the city.